Originally set to launch in late 2018 for the PlayStation 4 and PC, the 3D adventure game Heaven’s Vault recently underwent a slight delay. The move to a Spring 2019 release date seems to be sticking, though, as developer Inkle has announced the title will launch on April 16th. This date only applies to the PS4 and PC versions. Mac and iOS users will have access to Heaven’s Vault at a later time that has yet to be specified. 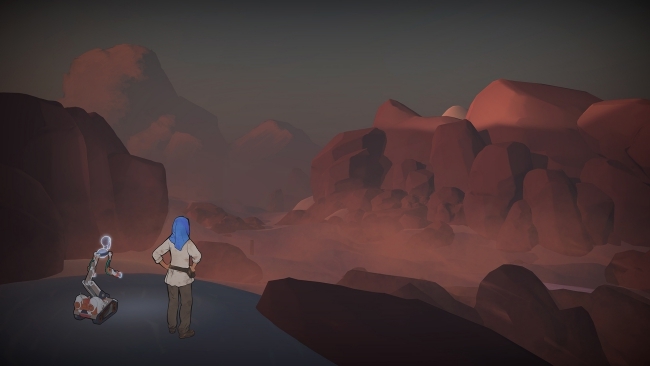 Heaven’s Vault is a sci-fi adventure game that will task players with exploring “a collection of scattered moons linked by rivers through space.” This vast area of wonder is known as the Nebula, which the game’s protagonist, archaeologist Aliya Elasra, must venture into to find a missing roboticist. While looking for clues concerning the roboticist’s disappearance, Aliya will have help from her robot assistant, Six. Six will not serve as the only character players engage with, either. Aliya will cross paths with a slew of other characters, as well, many of whom will play an integral part in the narrative. Given the game’s genre, of course, player choice is also meant to have an instrumental role in how the story unfolds. As far as gameplay is concerned, puzzle solving and sailing rest at the heart of the Heaven’s Vault experience. With regards to puzzle solving specifically, players should anticipate an emphasis on language, since deciphering and translating languages will take up the bulk of such mechanics. Meanwhile, sailing in Heaven’s Vault will allow for the exploration of abandoned sites, rivers, shipwrecks, and much more. Many may be familiar with developer Inkle due to its BAFTA nominated title, 80 Days. Similar to Heaven’s Vault, 80 Days is a narrative-focused adventure game. Instead of exploring space, however, the main character Phileas Fogg attempts to circumnavigate the globe in 80 days. Unfortunately, the title has never come to consoles; it’s available on PC, android, and iOS devices.